Whether you are experiencing a flood or you just need regular maintenance, most customers call the best sewer camera video inspection company in San Diego for an in depth sewer inspection. Our reliable team of professionals use top-of-the-line devices to help you locate any leaks or damages to your sewer line. A sewer camera can be the answer to discovering the cause of a recurring drainage problem which may need an immediate drain cleaning. 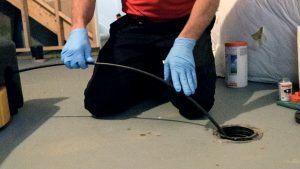 Regardless of whether it is a home or a business, a sewer camera inspection is often what is recommended if the true nature of the recurring blockages is going to be determined so that it can be effectively dealt with. The use of a sewer camera can identify the exact nature of the drain blockage, regardless of whether it is a low spot (or bow) in the construction of your pipes, broken drain lines, off-set drain lines, separated drain lines or something more insidious like intruding tree roots. It may also be an indication that hydro-jetting may be necessary. Once the cause of the blockage has been determined, steps can be taken by Plumbing and Drains Solutions to ensure that the problem is dealt with in the most effective and efficient way. One of the primary things that a sewer camera is used for is before the purchase of a new home. By calling the experts at Plumbing and Drains Solutions to do an inspection before the purchase of the home, you can determine if the home you are about to purchase will need any extensive plumbing work before you make the commitment to the purchase. Many of the times with the documentation of the problem (which you will receive from Plumbing and Drains Solutions) you can convince the seller to absorb the cost of the repairs or cleaning before you make the purchase. Call (619) 345-5550 today to schedule service with our resourceful San Diego sewer line repair specialists at Plumbing and Drains Solutions. It is nearly impossible to recognize when you need to have your sewer line inspected, especially since your main lines run underground. However, there are some signs that you can look for to help you determine if an inspection is necessary. For instance, frequently clogged drains and consistently backed up toilets are signs that your sewer line might need to be checked for a clog or root intrusion. If you are experiencing any plumbing issues that you are unsure about, don’t hesitate to call our San Diego plumbing company. We can troubleshoot with you over the phone and help provide the answers that you need. Not only do these cutting edge tools allow us to quickly identify and resolve your problem, but we can also get a more accurate reading of how much the service will cost before we start working. Our initial estimates are always free of charge. We know that it’s only logical to get multiple opinions to ensure that you are getting the best deal for the best service around. That is why we offer free second opinions. We are proud of our honest and upfront pricing, and we are happy to give you all of the information you need to help you make the best decision. Plumbing and Drains Solutions, the best sewer video inspection company in San Diego is always on your side. So, if you are looking to determine the nature of a recurring drain problem, or if you would like to ensure that the home you are about to purchase does not have any drainage issues before you commit to the purchase, they you may definitely want to consider a sewer camera inspection for your peace of mind. Call us today for a plumbing service estimate from San Diego’s top rated plumbers. You don’t have to let a damaged sewer line ruin your day or your bank account. Contact us at (619) 345-5550 and put your mind and at ease while our plumbers diagnose and resolve your sewer line problem.